If the UK ICC does not suit your requirements because you own (or intend to own) a larger barge, then you will need additional accreditation such as the ‘Grande Plaisance’ licence, more commonly referred to as the ‘EGP’ (Extension Grande Plaisance). This gives you the freedom to skipper vessels of unlimited length across Europe. How can I get the EGP? As the ‘upgraded’ skipper licence, this course is not open to inexperienced boaters. 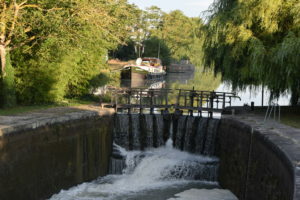 You must be a competent inland waterways skipper – albeit on a small boat, and hold the ‘EI’ already. Please visit our ‘EI’ information which explains the two available routes for this essential licence. Any national may take the course. The EGP licence needs attendance on a two day practical course, there is no written or theory test. For novice or inexperienced inland waterways boaters looking to achieve this licence, there is a fairly lengthy process to work through to get you ready for the EGP. For example, if you do not currently hold any skipper licence the entire process will take at least 8 weeks for EU nationals, or 11 weeks for non-EU nationals. This PDF timeline may assist your preparation and planning. The EGP course details are available at Service Public website - ‘Google Chrome’ has an automatic translate function.